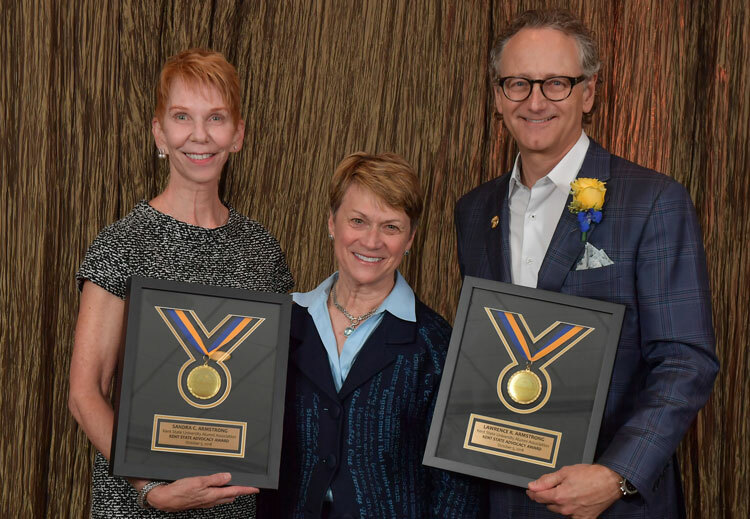 Irvine, Calif. — International design firm Ware Malcomb announced that its CEO, Lawrence R. Armstrong, received the Kent State University Advocacy Award together with his wife, Sandra C. Armstrong. The Kent State University Alumni Association honored the couple and other 2018 Alumni Award recipients for their exceptional contributions in their chosen field, in their communities, and at Kent State University at a special ceremony on October 5, 2018. Sponsored by the Kent State University Alumni Association, the Alumni Awards are the university’s most prestigious honors given to alumni. In 2016, the new Lawrence R. and Sandra C. Armstrong Gallery located within Kent State University’s new College of Architecture and Environmental Design (CAED) building was opened. As an important venue for expanded knowledge and peer-reviewed experimentation in the area of visual arts, the Lawrence R. and Sandra C. Armstrong Gallery features student and faculty projects, site-specific installations, traveling exhibitions, design competitions and other curated events that expand the CAED’s audiences and partnerships. It also provides a thought-provoking public forum for design discourse and dissemination. Armstrong and his wife also founded the Armstrong Family Scholarship for the College Architecture & Environmental Design and the Armstrong Family Visiting Artist Series for the School of Theatre and Dance. Established in 2013, the Armstrong Family Visiting Artist Series is a unique program that allows a guest professional choreographer to be invited to work with students each year. Armstrong, who is also an accomplished artist, exhibited his Layered Vision series at the opening of the Lawrence R. and Sandra C. Armstrong Gallery, and later donated one of the pieces from the exhibit for permanent display. More information on Armstrong’s personal work as an artist can be found at www.lraart.com. Armstrong is a current member and past Chair of the Kent State University Foundation Board of Directors, and he and his wife serve as Co-Chairs of the Kent State Comprehensive Campaign Executive Committee. In 2013, Armstrong was the keynote speaker at Kent State’s Spring Commencement ceremonies.